At Wingz, we’re all for improving body confidence. We want women everywhere to be proud of who they are, whether they are tall, short, fat, thin, old, young, have lipoedema, scars, tattoos they love/hate…you get the picture. We posted a blog last year gently poking fun at a certain slimming club, and although it went down well at the time, later on we received some criticism for being disrespectful to people who wanted to lose weight. The point wasn’t to ridicule the members, but to point out that every slimming club was the same with the draconian and often strange eating rules (avocado =NO but 10 Muller Lights in a day = OK). Anyway, we didn’t mention the world of diets and slimming clubs for a while in case we were accused of picking on the massively profitable multinational companies. But this week some news has come to light that just makes us think – get outta here. It was announced this week that WeightWatchers are pushing their diet on impressionable teens. Remember being a teenager? Can you remember how self-conscious you were back then? 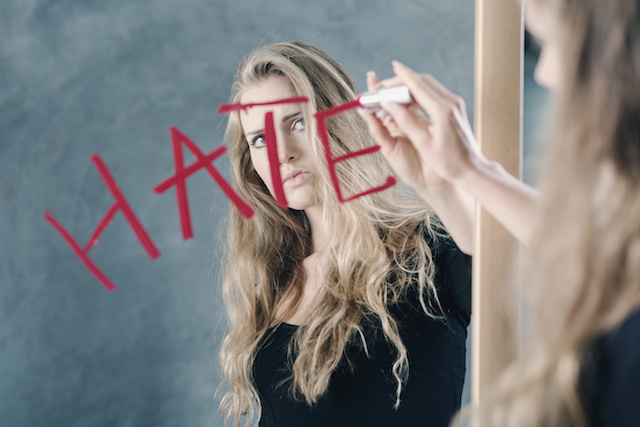 How any slightly negative comment could wound you? It’s probably ten times worse in the 21st century than it was when I grew up; we didn’t have celebs on Instagram sucking in their stomachs to promote diet companies, or having bum implants to look like a Kardashian. Hell, we all know that even the Kardashians don’t really look like that. It’s fake fake fake, and with teens addicted to Instagram and wanting to look like their idols, no wonder their body confidence is low, while diets and weight loss are even more pervasive. It’s not just opinionated bloggers who think WeightWatchers are wrong to target image-conscious teens with their weight loss programmes. Twitter erupted into a #WakeUpWeightWatchers storm, with criticism from all over, and The British Dietetic Association (BDA) waded in, telling The Telegraph that encouraging teenagers to start dieting was sending them “entirely the wrong message” and could even send them along the path of yo-yo dieting, something that they really should be avoiding. Of course, Weight Watchers defended their decision, saying that they were only trying to help. How very altruistic, when it’s been shown that once you get sucked into the world of yo-yo diets, it can be a lifetime’s work to escape the constant merry go round of weight loss and weight gain. If you’re thinking that maybe they just want to safeguard the health of developing teens, as, after all, the diet will be offered FREE to teenagers, just read the Weight Watchers official press release from February 2018. “Weight Watchers plans to implement a number of initiatives to ensure its brand aligns with its values and purpose. These bold moves include the following. Recruitment of teenagers and retention for as long as possible? That should help them increase their revenue to more than $2 billion, that’s for sure! On the POSITIVE side, a UK organisation that specialises in intuitive eating, getting people off the diet roundabout and making peace with food and their bodies is also offering FREE membership to UK teens. The Beyond Chocolate ‘FREE a Teen’ initiative is sponsoring teenagers who are concerned with weight, body image and thinking about joining a slimming group the option to receive a FREE copy of the Beyond Chocolate book, and free access to the Beyond Chocolate website materials, designed to help them think about reasons they are overeating and steer them towards a healthy relationship with food instead of a dysfunctional love/hate relationship. Just email info@beyondchocolate.co.uk with TEENS in the title and they will be in touch. Would you send your teen to a slimming class? Did you start dieting in your teens and regret it? Do you think it’s a great idea getting kids onto diets?